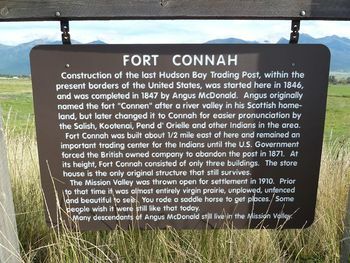 Fort Connah (1846-1872) - Established in 1846 by Neil McArthur as the last Hudson's Bay Company fort/trading post in the United States. The fort closed down in 1872. Also known as Flathead Post (3), Fort Conah, Fort Conna, Fort Cotta and Fort Konah. Established in the summer of 1846 by Neil McArthur as the Flathead Indian post at Crow Creek. In 1847 Angus McDonald and his assistant George Simpson Jr. were sent to complete the fort and establish the trade. The post was completed by the end of 1847. Angus McDonald's Nez Perce wife Catherine joined him that fall with her newborn daughter Christina. Angus and his family remained at Fort Connah until he was promoted and transferred to Fort Colvile in 1852. When the fort closed down in 1872 the fur trade in Montana ended. One of the three original buildings still remains and is believed to be the oldest standing building in Montana. 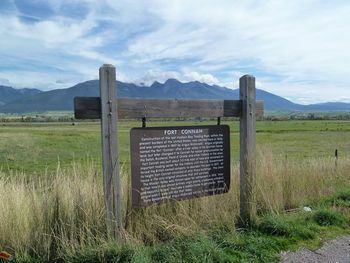 The site of Fort Connah is listed on the National Register of Historic Places. The remaining building is a hand-hewn, 375-square-foot log building that is the only surviving structure. The massive ten-inch-square hand-hewn beams are stacked horizontally to form the walls, the same type of construction used by the Hudson Bay Company. Aerial infrared scanning of the surrounding land shows tepee rings where Indians camped while trading. Location: 4 miles north of St. Ignatius, Lake County, Montana, on Hwy 93. Anderson, Steve A., Angus McDonald of the Great Divide: The Uncommon Life of a Fur Trader, 1816-1889, Museum of North Idaho Press, 2011, ISBN 978-0-9825220-2-8. This page was last modified 10:05, 17 March 2019 by Bill Thayer. Based on work by John Stanton.